Chinese New Year is just around the corner, and this is the time for family and friends to gather together. 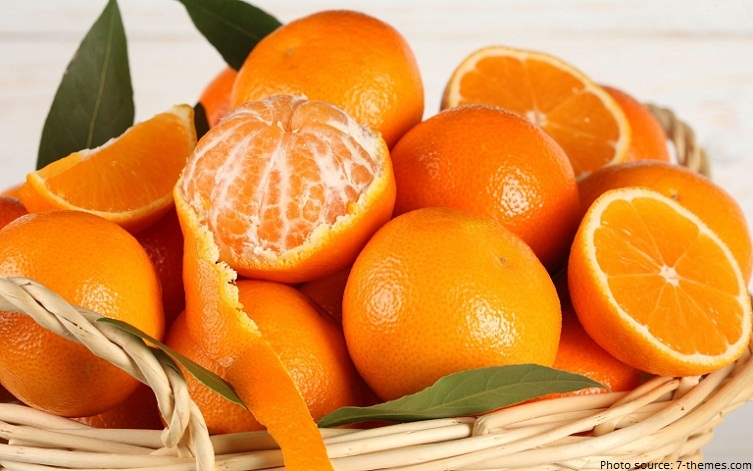 During this beautiful seasons, bright mandarins will be out and to enjoy during this festive. They are not only used as decorations but given as gifts when visiting family and friends as a symbol of sharing abundance and good fortune. According to legends, Chinese New Year started with the fight against a mythical beast called the “Year.” Every year, on the first day of the year, the creature would awaken and descend upon the village. One day, a mysterious old man show up and tell the villagers, ” The beast is easily scared. He does not like the color red. He fears loud noises and strange creatures. So tonight, spread red across the village. Hang red signs on every door. Make loud noises with drums, music, and fireworks. And to protect your children, give them face masks and lanterns to protect them.” Since then, this day has been named Guo Nian which means ‘to pass over the year.’ The Chinese consider this day as an auspicious one, as it brought them new life and salvation. According to the legend, when the monster Nian would come and terrorize the villages. The people would hide in their homes, prepare a feast with offerings to the ancestors and gods, and hope for the best. That is why food plays an important role during Chinese New Year. 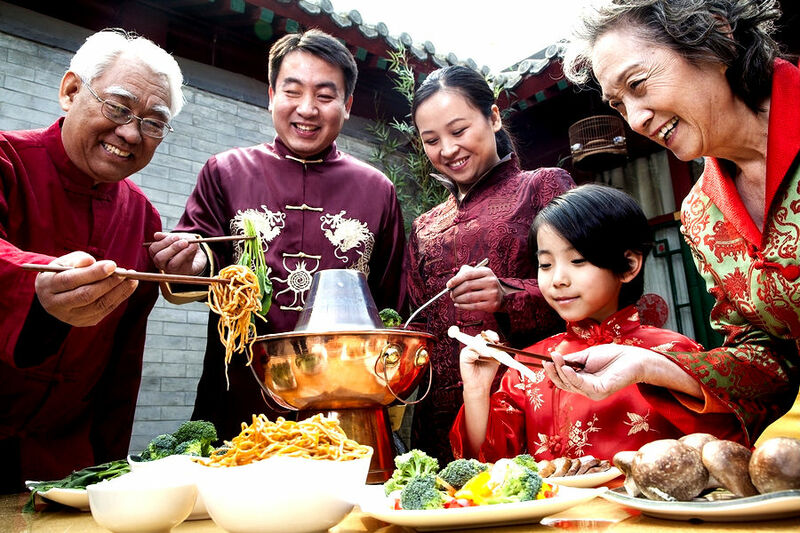 The number of dishes that are prepared during the gathering will bring good luck to families. The dishes are created to give blessings, prosperity, happiness, and auspiciousness for the next year. So What’s For Eve Dinner? 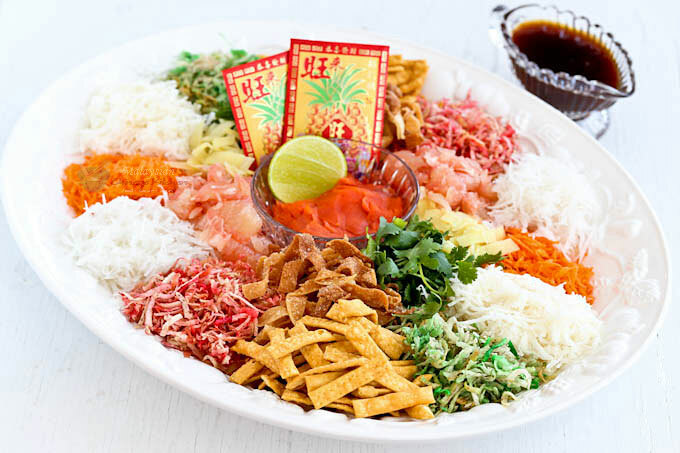 Yee Sang is the ritual0 to toss the mixed ingredients high in the air with a shout of “Yee Sang”, “Loh Hey”, “Huat Ah” and all the good words which literally symbolize of the wish for our fortunes to rise and expand during the forthcoming year. Fatt Choy it’s a hairlike fungus that has a name that sounds like ‘Prosperity’. 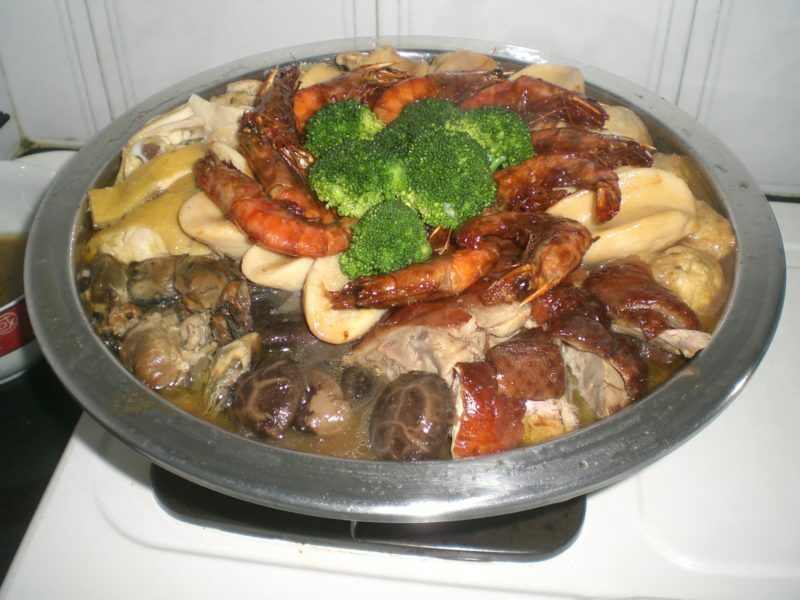 It is usually braised with dried oysters and other vegetables. 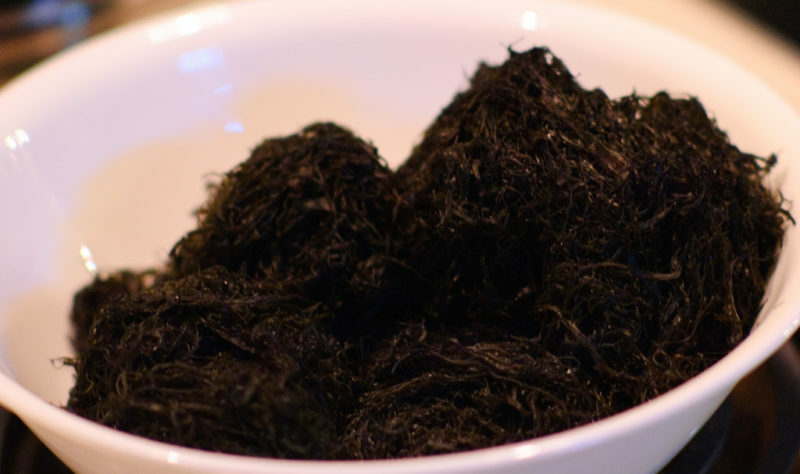 It is also called as Fatt Choy Ho See if your dished has dried oyster with it. Fish during Chinese New Year is interpreted as an auspicious symbol for wealth. 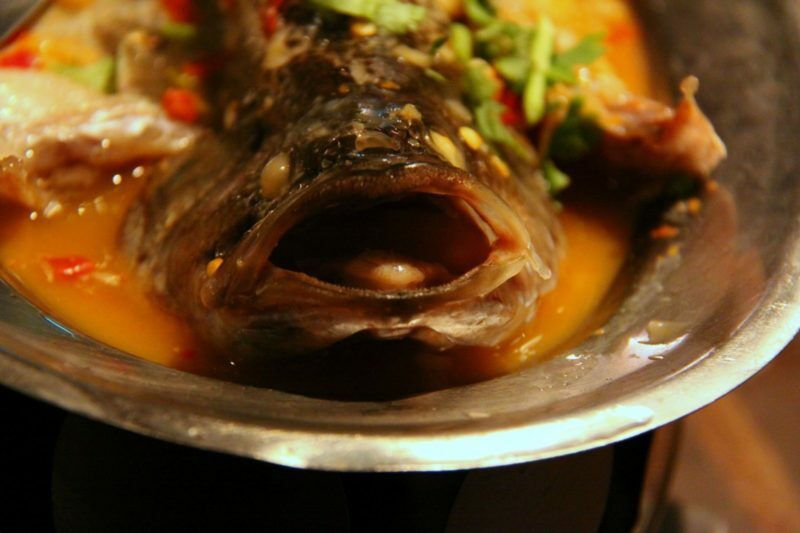 The fish should be served whole – the head and tail signifies a beginning and an end and thus represents completeness. It is customary to serve a fish at the end of the evening meal, symbolizing a wish for abundance in the coming year. The suckling pig, a type of Cantonese dish with aristocracy roots, was served during the Qing Dynasty and an epicurean treat for centuries. The pig is always presented “as a whole” which symbolises completeness and is an auspicious sign. There are more dishes prepared during this festive according to the country. Some prepared delicious vegetable spring rolls and other dishes to represent great and harmony meaning for the new year. Whatever it is, make sure to drink plenty of water to prevent any illness. But hey, you can still eat, drink and be merry without over-indulging on all those bad fats. Just make a conscious effort to eat the good ones and pay full attention to what you are eating. Happy Chinese New Year everyone! May this New Year gives you prosperity and peace.